I woke up feeling much better about life than the night before, but still wasn’t sure about the seven hour trip up to Manic 5. Technically I was off the hook because Steve had already conceded it, but I knew if I changed my mind in the morning Eric would probably agree and we could still do it. It was a stunningly beautiful day with almost perfect riding weather, so I had some guilt about leading the campaign to drop Manic 5. I mentioned to Steve that because I had declined to go to Manic 5 I wouldn’t object to any future rides he suggested. This was my way of throwing him a bone for the disappointment, but even as I said it I realized what a terrifying commitment I had just made. Who knew what he had in mind? My total dirt bike experience amounted to a single ride of about 30 miles two years prior. But the words came out of my mouth and I couldn’t take it back. I could only hope for him to take it easy on us, which was—if you know my brother—a foolish thing to wish for. We finally decided to stay around Baie Comeau and try some local rides that looked interesting, and then (as a compromise) take a short trip up Rt 389, which leads to Manic 5, but stop at a point 23 km up at Manic 2. Manic 2 is smaller but still impressive, and again the tour wouldn’t start until June 24 so we’d just be looking at the outside. We had thought we’d change our ferry reservation to take the 2 pm boat from Gadbout but it was already booked solid and couldn’t squeeze in three motorcycles. So we opted to stick with the evening ferry from Baie Comeau, which meant we had a full day to kill. While we were in wifi range at Tim Horton’s I booked a hotel in Matane for the night, since the ferry wouldn’t get us in until 10:30 and rain was a possibility in the morning. While exploring points south of town in Baie Comeau, we found an intriguing unnamed road through a bog that seemed to go nowhere. No signs, no houses or businesses, just a strip of dirt heading off towards a forest. This was the kind of thing we were looking for, so off we went. Gradually the road declined to a rutted single-lane of sand, and we had a few tough moments. Eric and I got through one nasty spot with great effort and some luck, but Steve crashed there. It was about 150 miles from “where Rich dropped the bike,” so we’re even. After picking up Steve’s bike, the road eventually declined into a track through a forest, which got tougher and tougher to ride. I stopped and pulled up a satellite image on my phone and it looked like the trail was going to peter out somewhere, but we plowed on ahead anyway, amidst a growing crowd of interested mosquitoes. Eventually, however, the trail did end and then we had another challenge to get the bikes turned around on a loose slope the width of a hiking path. Perhaps the best thing I can saw about this part was that we encountered several off-road challenges that increased our confidence in the bikes and taught us a little about handling them. Nobody dropped anything in the forest, so it was a success. Our second exploration never went off pavement, but we found a beautiful point by a nature preserve where the road ended. There was a little wooden pavilion there, so we stopped for lunch, explored the beach (found some strange gray/blue clay that never seemed to dry out) and talked about great trips we’d had in the past. It was just perfect weather for hanging out. No bugs here, and for the entire hour or so we saw only one car. 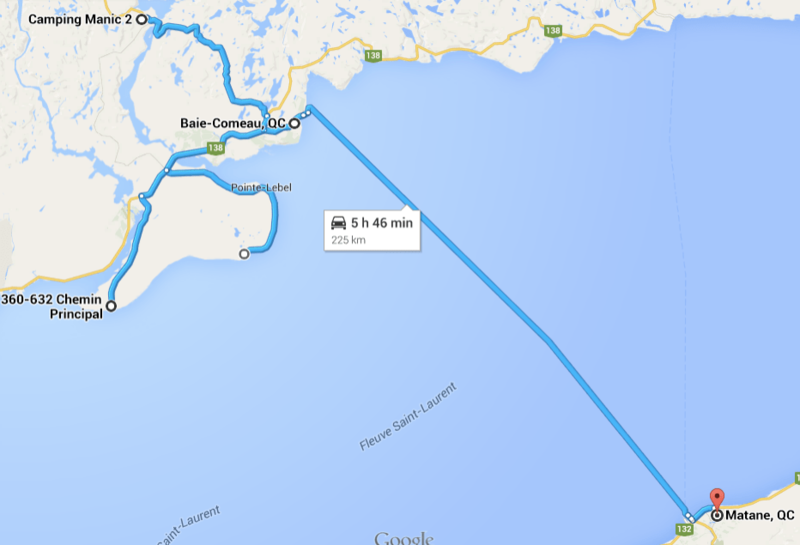 Well, after lunch it was time to loop back up to Baie Comeau and ride Rt 389 up to Manic 2. And once again Quebec surprised me. The road was amazing on this sunny day: smooth pavement, lots of sweeping curves, no traffic, and great scenery of lakes and rivers all along. No flattish boringness here—this was the sort of ride that motorcyclists live for. So now I really felt bad about skipping the big trip to Manic 5, but it was too late by this time to make the full trip. At Manic 2 we found a great view from a bridge downstream. As with Manic 5, there were no tours before June 24, so we turned around there and tried some side dirt roads just to see where they went. They went forever, dotted with vacation homes alongside each one of the many lakes in this area. After nearly an hour of wandering we realized we could ride dirt all day and never find the end, but it was time to start heading back to Baie Comeau for dinner and the ferry. Back in town, we chilled out for the afternoon at local pub. Pizza, beers for the other two guys (I’m not a beer drinker nor do I drink much soda, so I had a lot of iced tea on this trip), and more talk. Eric mentioned how it takes a few days to get into the trip and we all agreed, but sitting here in the sun on the patio at a far away pub, with little time pressure, we were really feeling the relaxation. After dinner we still had a lot of time to kill, so —what else?— we got ice cream, and then headed to the ferry dock early. Our ship, the MV Camille-Marcoux, came in at 7:20, we boarded at 7:45, and by 8:00 pm we were slowly gliding through dead calm waters out of the harbor and across 62 km of open water at the entrance to the Gulf of St Lawrence. I say “Gulf” because now we were well beyond the river and seaway, and deep into salt water leading to the Atlantic Ocean. Inside the ferry we were given yellow nylon ropes to “tie down” the bikes. These were a bit of insurance against tipping over, but wouldn’t do much in heavy seas. Fortunately we saw no waves taller than our own wake as we cruised the water for two hours and twenty minutes. The ship was roomy enough that it was like being on a budget cruise. Most of the passengers snagged reclining chairs in the front of the ship and fell asleep watching some movie in French, but it was nice enough on deck that we spent most of our time up top, watching the sun set. At 10:30 we rode off the ship in the dark, our first ride in the dark. I hadn’t ridden an motorcycle in the dark since 1986, so it was a bit weird at first. The hotel I’d booked at dinner the night before was only a quarter mile from the dock, so it wasn’t long before we were settled at hotel, sucking up the free wifi, and doing the usual pre-bedtime motel routine. Part of my packing plan was to bring shirts and underwear that would be easy to wash in the bathroom sink with a little liquid soap (polyester and silk fabrics are great for this; no need to get special “travel underwear”). But I couldn’t pack a lot of clothes so it was already time to do a quick laundry and hang things up to dry in the shower. That process took all of five minutes, perfect by bachelor travel standards. At this point there was no question that a storm was going to hit us tomorrow. We looked at the radar but really there was nothing to be done about it. Our wet-weather gear would be tested, but the trip had to continue. Meanwhile, back to bed. It was my turn to sleep on the floor, and I finally got in my sleeping bag around 11:30 pm, wondering (as I did every night) what the next day would bring.